Selecting Webs.com was an easy choice when we were setting up our site. This company offered a user friendly site for that was easy to navigate for novice website builders. They have a built in shopping cart which allowed us to be able to sell our book from the site. In addition, there are so many templates to choose from in a wide variety of themes. We've changed our look a couple of times since launching TINK INK and debuting The Bay Gull in July, 2009 and it is so easy modify the site! Click here or see below to read the whole review. Thanks, Webs.com, for making our internet presence a breeze!! We know that finding the perfect gift for a kid can be hard. Who knows what they are into these days and who’s to say that they will like the latest toy a month from now? The solution isn’t to run to the mall and grab a pack of socks that look like they may fit…don’t be that family member. Instead, check out our example site this week: TINK INK Publishing, a site that promotes the work of Emerson M. Colwell, Jr., a children’s book author. TINK INK has only one book out so far, but it is wonderfully illustrated and written by Colwell himself and would make an excellent and unique (not to mention educational!) gift for a child. A plushy of the main character can also be ordered. Check out the site! - Webstore lets you organize all of your products easily for visitors to look through and purchase. - Contact page gives your visitors a channel of communication with you. It’s great for creating relationships, sealing a sale, or a way for visitors to troubleshoot. - CafePress App let you create shirts, mugs, bag, and much more for your website that visitors can purchase to support you. We think that TINK INK has done an awesome job keeping their site simple. The top navigation bar makes browsing a breeze and there is enough empty space on each page to keep visitors interested. Don’t worry, that’s not a typo. Empty or “white space” on a website is almost as important as the content itself. You want to make sure each webpage you create has just enough white space as this keeps each page from looking too cluttered. Having a lot of white space also keeps a visitor’s eyes moving so that text or links that are bolded or different colored stand out more. This is a great way to draw attention to a link that you want visitors to click on. We hope you enjoyed this week’s example site. Stay tuned as we continue to help you with your holiday shopping with more awesome websites from our Webs users. If you want your website featured here, leave a comment below and you might be an example site in the future! 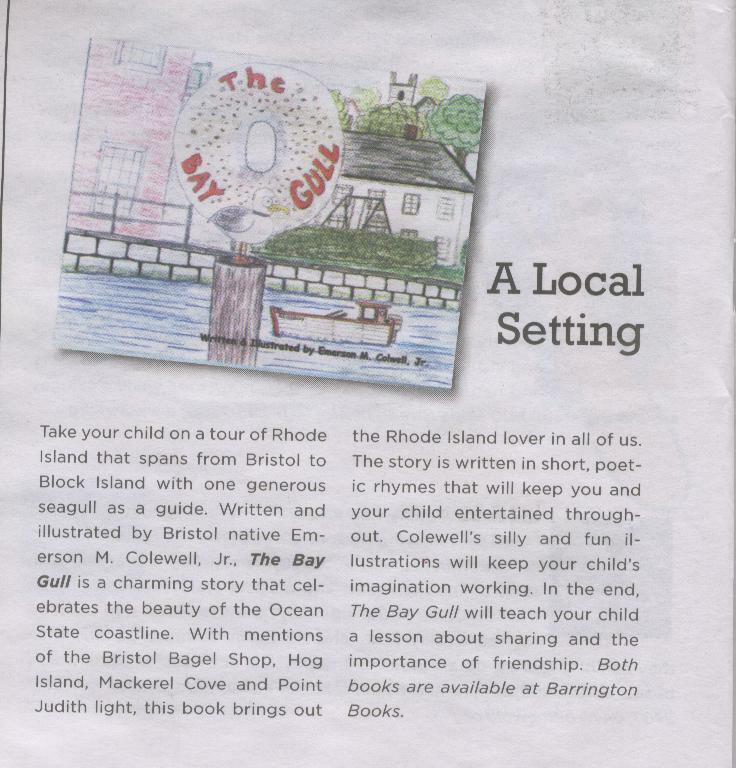 And speaking of community celebrations, check out this new cleverly titled, independently-published kids book about a sea gull who finds a bagel in Bristol and shares it on his travels. While the illustrations are fairly rudimentary pencil drawings, the concept and nod to familiar Narragansett Bay landmarks such as Prudence Island, the Newport Bridge, and the Castle Hill and Point Judith Lighthouses make it hard to resist. The book includes a fun map for kids of the flight path of the gull, from Bristol, all the way down to the southeastern tip of Block Island. Mr. Colwell will be at Barrington Books on County Road in Barrington, Rhode Island: Thursday, July 2 at 10:30 am reading and signing copies of his books. This column was originally published on 7.2.09 in East Bay Life - East Bay Newspapers. For story reprints, contact [email protected]. Anika Denise is a children’s book author, mother of two little girls, and the host of Thursday morning story hour (10:30 a.m.) at Barrington Books in Rhode Island. Her column "Bookmarks" is a weekly feature of the East Bay Newspapers. Bookmarks reports on new trends in children's books, discusses classic and emerging children's authors and artists, and provides suggestions and advice for parents looking for books to read to, and with, their children.